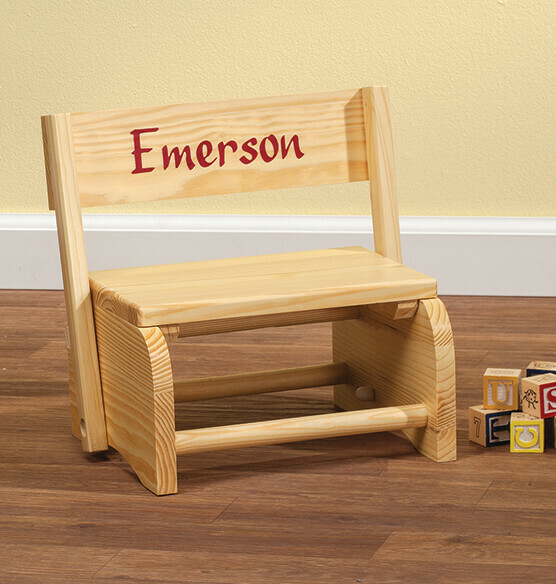 Our wooden personalized childrens chair provides a little chair that's just right! Our personalized kids chairs also make sinks and toy shelves reachable for toddlers. Natural finish chair of 3/4" thick "knotty pine" wood is smoothly sanded, joined with rounded screws. Base of the stool is 9 3/4" x 10 3/4"; seat is 6" from the floor, 12" high with back up. We'll hand paint your child's name in block letters. Specify a name for each personalized chairs for kids. Limit one line, 20 letters or spaces. The kids love to be able to reach the sink and this chair also converts into a step stool which really works great for them. This chair is beautifully crafted, looks even better than in the catalog. Personalization came as ordered, can't wait to give to my 1 yr old nephew for Christmas. Price can't be beat-you won't be disappointed! My Great grandson loves his chair and is able to carry it himself! The family is happy that he is already getting to connect up that the name on the chair is his own! I bought two of the little step-stool/chairs. One is for our fifteen month old grandson and the other is for my good friends two year old grandson. I haven't given them to the babies yet as they are gifts but I am pleased with the quality and know that they will love them. I would purchase the chair again. The chair is a good size for a child. It has a smooth finish. It can be used as a step stool or a little chair. I bought this chair for my grandson and he loves it! I bought this product 1x and 7x more! Grandkids use them to wash hands, brush teeth, sit, watch TV and I bet for reaching forbidden areas!!! Good to reach the potty too! Every new baby gets multiples of the same item that is usually outgrown very quickly, no matter how adorable it is. 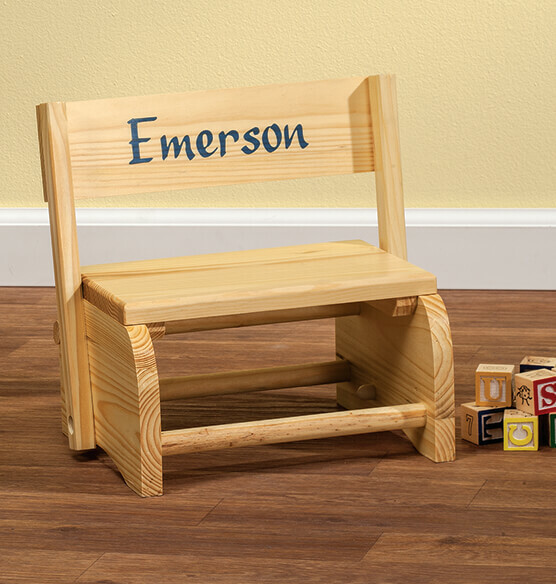 This folding, sturdy, step-stool chair is not only fun for the child but personalized to make her/him feel special. It helps later in toilet training, reaching the sink to wash hands, and many other things. For a second child, she/he can play with it and not feel left out as new baby gets gifts. I just love getting this for my grandchildren, each one has one with their first and middle names. It's just something special. This is a gift for my two year old granddaughter. I am sure she will love having her own chair! She will love to be able to carry it too all by herself!! Just the right size for my 15 month old granddaughter who is getting very curious. Very sturdy for what it will be used for. Price was also very good after doing comparison shopping. Have nothing bad to report. Could possibly make product in a couple of colors but other than that it's a very good purchase. Fast delivery and excellent customer service doesn't hurt either. First ordered this chilren's chair 22 years ago (still in use by little ones in the family) for my 1st grandson. Most recent order was for 2nd great-grandchild. It has become a family tradition that each [great] grandchild receives a chair as one of their Xmas gifts on their 1st Christmas. They find many uses for them as they grow and love having their own chair with their name on it. Toddler nephew is delighted with this gift. Little one can learn to recognize his name sooner. This chair will be in my great granddaughters room, ready for her to sit on or use as a step stool. Provides two things toddlers like: their name on their belongings and a way to "do it myself." I bought this same item three years ago for my Granddaughter and she has really enjoyed it. Now that I have a Grandson I must get it for him. Can't wait to give it to him at Christmas. I was very pleased with this purchase and, in fact, ordered another one for another toddler friend! The first one I ordered had a very long name, and they fit it well. Didn't look crowded. I had a stool like this when I was a small child (60+ years ago) and remember how useful it was for getting into things... I loved it! As it is such a help getting to counter tops, etc., the parents may not like it as much as the child! NOT JUNK! EXCELLENT BUY! Two of my grandchildren have this they loveit so , I am giving the other three the stools for Christmas. Can't wait to see their faces when they have their own. I gave it as a gift and it made a hit at the party, the quality was nice the name on it was bold and clear, it looked like it cause more than I payed. This is the chair I would have liked for my children. 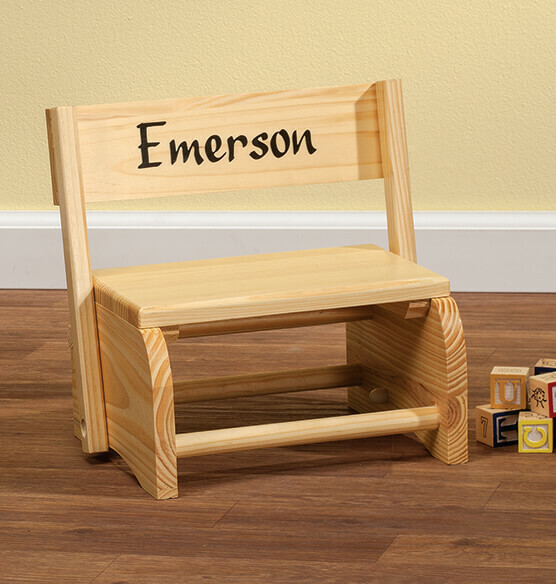 However, we bought this personalized chair for our little grandson. The lettering of his name is clear and centered. I'm sure he will enjoy using it over the next few years. It seems quite sturdy enough. Thank you Mileskimball for offering this great chair from you website. This the second chair I've ordered to give to my grand chil. There is absolutely wrong with it! It's extremely handsome, useful and looks great in a little tots room. I am very happy I purchased this chair for my nephew. He loves is as a chair and stool, and knows it's his since we were able to have it personalized! I bought this for my 2 1/2 year old nephew. It's durable easy for him to carry and perfect height for use at the sink. He loves it and will also use it as a chair to watch TV. This was for my grandson and he loves it. He uses it in his room to help reach things in his closet. I love this little child bench.. This is for my 13month old grandson Diesel..I love this little bench. Bought for our granddaughter because it is similar to one her Dad had, only his was more colorful(circus animals). Came well packed,and well made for China. Hard to find inexpensive wooden toys now-a-days. This was a great gift for my Great grand Child one she can enjoy for a long time. Also a keep sake for her mom to have. The chair/stool makes it so easy for the kids to brush their teeth, wash their hands, AND it's theirs!! Their name makes the difference! It's very sturdy and made with good wood. We were very empressed. I bought this for my granddaughter for Christmas. I think she will like it a lot - her mother & I do! Hope the little one that is receiving this will enjoy it like I did! Bought this for my great-grandson. Much better price than other catalog companies, and though it may not last for years, it should last until he outgrows it. Would have liked the name in a little brighter red (it was sort of an ombre effect), but still very cute. Stool came with damage to a leg (wood chip due to being hit somehow). I just glued it back on. 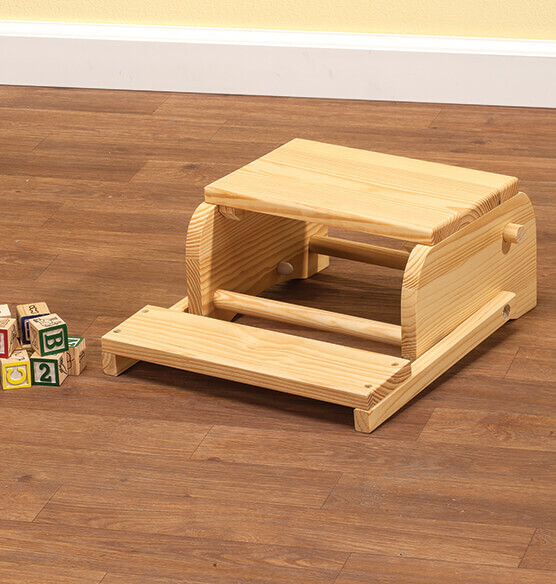 I love this stool for my toddlers use as a stepping stool and small chair. They used screws to put back on (rough end inside stool with plastic cap, which is easily removed unfortunately). But I love the design, always have. This product is beautiful, but was confused when there was nothing to put the two pieces together. That was kind of frustrating. I would probably not buy this product again. The product is expensive. When screwing it together some of the wood split. Luckily my husband was able to glue the split and screw it back together. 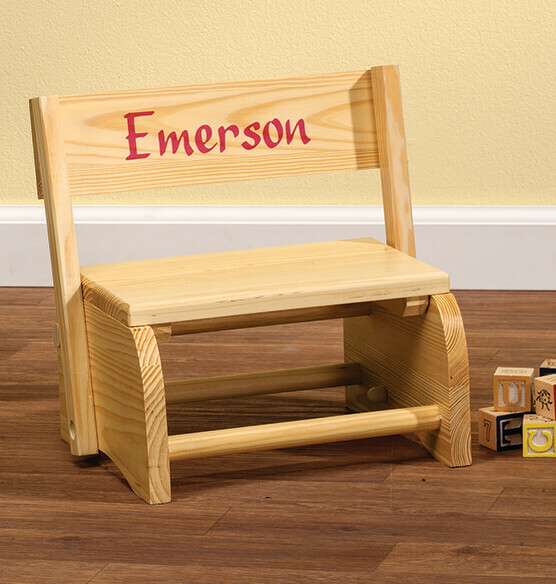 This is a cute little chair, personalized nicely, and it converts to a step ladder. The problem is that it is TINY. Yes, toddlers are small. But this is almost doll sized. The step chair for our grandson arrived today. What a disappointment. It is cheaply made. The seat seam is already coming apart, there is a flaw on the top of the back of the chair that is very obvious, and not all the wood pieces are stained. Plus, if I want to return a flawed item, I have to pay the postage! We had much trouble with this stool! We had to get three stools before we had one that was sort of usable. It's still not great. I was disappointed with this stool. My 4 yr. old grandson who is very small for his age ,is not going to be able to sit on this as it was smaller than what my daughter and I expected. We have one of these from when my kids were little. Now my granddaughter will have one of her own.